I think Foust goes too far. Blood-money *is* a form of justice. Foust is being obtuse in ignoring that. Right. Blood money is a form a justice – but I think what he was saying, is how this entire situation spiraled out of control, so much so, that we moved away from what actually caused this situation in the first place. I agree with you though – the settlement was reached and for the families at hand this was their form of justice. I actually wish we could now drop the Davis case and just move on to far more pressing problems plaguing Pakistan. Definitely. Though it will be interesting to learn what the full story is/was. i guess the shariah law came in handy for the US this time. Pakistan government is not fighting against terrorism or terrorist, its fighting agains its own poor people. Such a shame for Pakistan. Blood Money… I was knowing that this practice was followed in Gulf Countries. Really surprised to hear in the case of country like Pakistan. Is this also allowed in all Islamic countries like Turkey and Malaysia? Blood money is used pretty frequently in Pakistan actually – it’s a common practice (if I’m wrong someone please correct me). A lot of people predicted this might occur with this case. What’s interesting is that blood money or diyat is part of Islamic law – so it’ll be interested to see how right-wing clerics now react. Shouldn’t a seperate case have been filed regarding the fact that he was a CIA agent operating in Pakistan without the country’s knowledge / permission? I think that’s what the outrage is about. Not about the acceptance or use of blood money. I mean could we have legitimately filed a case against them? There are spies from different countries operating EVERYWHERE. 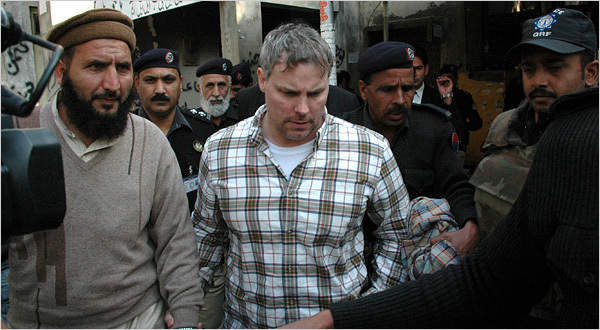 The outrage was originally about the fact that this man should be held accountable for his crimes in Pakistan if he is not a diplomat – the outrage now is about the CIA presence in Pakistan. everybody is in state of confusion… whats going????? if the relatives of deceased have to forgive them then y did they do so much drama….. they can forgive him before ……..!!!!! and if they are really ready for this then y it is hided??? and what about shumaila…. who sacrificed her life in order to gain justice but… whats this!!! this is really shameful! Sweet, now can we move on to real problems?! Ive been over this story before it even took over eveything. Spies are everywhere and we dont know what they are doing and it doesnt really matter what anyone has to say in regards to this, they will continue to operate. It doesnt matter who is in power, it doesnt matter what country was involved, it doesnt matter how much money was involved. Hopefully they just wont be as trigger happy in public any longer to avoid scenarios like this. In regards to being let off because of Blood Money, I think its such a brilliant ending to this plot. Kudos to whoever thought this lovely little nugget up. The blood-money solution for Davis may be against the Sunnah of the Prophet Muhammad (PBUH). When a case was brought before him, and one of the party happened to be non-Muslim, he judged the punishment of non-Muslims based on their own tradition and NOT Islamic jurisprudence. So Davis should have been given the death penalty or life without any chance of paroll, according to American law. Similarly, the blood-money CANNOT be applied here because one of the bereaved, the widow of one of the victims, committed suicide, and before passing away, stated that she would NOT accept blood-money. That should be accepted as her will. Absent her consent, blood-money becomes irrelevant. But we all know America would do whatever she wants to, if not blood-money, she’d use a different excuse. aaj hum ko apnay Pakistani honay per Sharmandgi hai… Shai kha tha kisi americe nay.. we can sold our mother only in 10 USD….. lannat hai humari Govt. per. Assalam o alikum…..In true sence we have not got truly independence yet because we are depending on other nation in many ways.so we have not taken even strict action on a agent of CIA.If it is justified that the matter of Deves is setteled according to law and whishes of the families of the suffering but in other hand there is rule and laws of a country which should be follow to each persong belonging to usa of pakistan but here the matter has wrong direction,First Davis has no right act without the permission of law.He is visiting pakistan and created panic in the country and he has no fear of police or other law inforcement agencies.In other country no one can voilate the rule of law as majority is doing in pakistan.Daves should be pubished with other many voilitation of rules and laws .He ignore all laws of country.We can say we are not still a independent state. I just had to vent somewhere, may be this is a good spot of some reasonable people who would actually listen. I liked your story on R. Davis but did not feel as if you did justice to it. Let me explain. All of a sudden all across it has become a discussion of blood money – Right or wrong? Sharia law allows it or not. We are discussing about things that frankly not the real issue here. I am not upset that Mr. Davis is realeased. I don’t know why he shot those 2 young men and why the car ran over the other. I don’t know why there were constantly conflicting statments about his diplomatic status and why so much so even Mr. Obama had to say something about it. I don’t know if he was planning a very sensitive CIA mission in Pakistan that might end up causing more deaths. I don’t know and none of us know and thats f***ing frustrating. aur kis azab ka intizaar karoon, mere bache, mere waldeen, mere chota sa ghar, sub to jal he geya hai, mein tanha andhere raste mein betha subha se darta hoon, bus aise he khamooshe se maut aa jae, mein zindage ke khiyal se darta hoon.. Roshnee a bhee jaye, qabroon ke andhere to qam nahin hon gey, mera lab shikasta, mere haat darmanda, mein sir kia uthaoon, jub sub he kuch kho chuka hoon, mein dua mangne se darta hoon..
so its just one more hole in our heart, one more unexplained misery that we have taken on our souls as a nation. We only care about Mr. Davis because America cared so much about him and we wanted to know why..otherwise, so many poeple have been brutally murdered by blasts, drones or some local violence and we have no answers. I am sorry for venting, but I did warn you in the beginning. politicians & legal agencies just exempilfy break in law & order system of pakistan .